Double Crown Records Seasonal Favorites Volume 3 arrived in the mail today. It's sitting now in Tikiland with Volume 1 and Volume 2. I can't listen to it until after Thanksgiving dinner though (It's the law.) Sausage & Sauerkraut for Santa is calling me though... might be hard to resist. 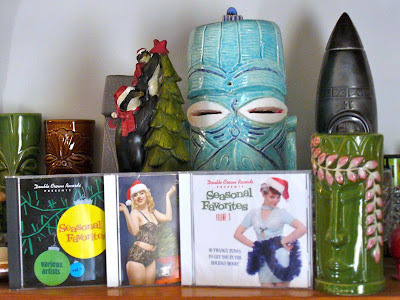 These are the best Christmas holiday surf (with some other fun stuff thrown in) compilations out there. Get yours today! or get all three at once if you're behind.